16,845 42nd LD Precinct Votes "left on the table" from those precincts with over 300 'not voting'. 32K voters registered in the 42nd LD did not participate. Click on chart too enlarge. Statistics below paint a dismal picture of participation in the 2014 General Election. 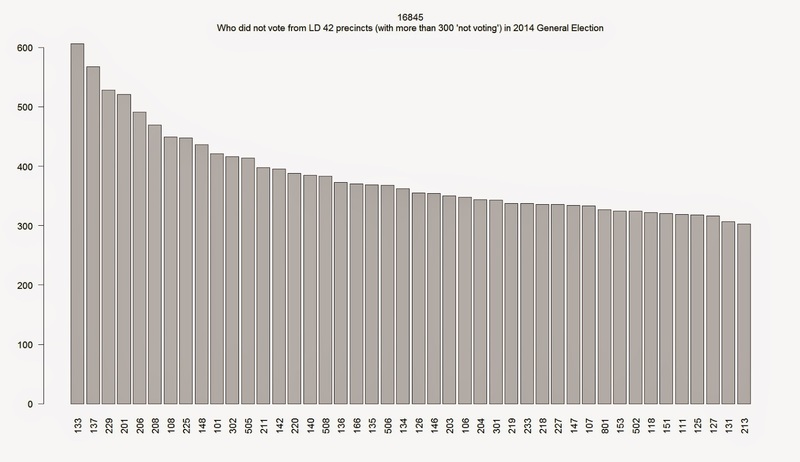 48,205 registered Whatcom County voters did not participate in the 2014 General Election including 31,938 from the LD 42nd where this year's critical races were held. Arguably, many of the top 30 'not voting' precincts shown above would have voted for Democrats. R Code here.